Elgin (/ˈɛlɡɪn/; Scottish Gaelic: Eilginn, Scots: Ailgin) is a town (former cathedral city) and Royal Burgh in Moray, Scotland. It is the administrative and commercial centre for Moray. The town originated to the south of the River Lossie on the higher ground above the floodplain. Elgin is first documented in the Cartulary of Moray in 1190 AD. It was created a royal burgh in the 12th century by King David I of Scotland, and by that time had a castle on top of the present day Lady Hill to the west of the town. In August 1040, MacBeth's army defeated and killed Duncan I at Bothganowan (Pitgaveny), near Elgin. 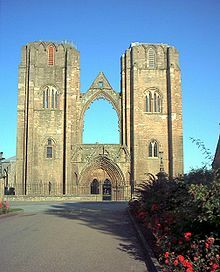 Elgin is first recorded in a charter of David I in 1151 in which he granted an annuity to the Priory of Urquhart. David had made Elgin a royal burgh around 1130, after his defeat of Óengus of Moray. During David's reign the castle was established at the top of what is now Lady Hill. The town received a royal charter from Alexander II in 1224 when he granted the land for a new cathedral to Andrew, Bishop of Moray. This finally settled the episcopal see which had been at various times at Kinneddar, Birnie and Spynie. Elgin was a popular residence for the early Scottish monarchs: David I, William I, Alexander II and Alexander III all held court there and hunted in the royal forests. Of these kings, Alexander II was Elgin's greatest benefactor and returned many times to his royal castle. He established the two religious houses of the town, the Dominicans or Blackfriars in the west side and the Franciscans or Greyfriars in the east. Further to the east stood the Hospital of Maison Dieu, or House of God, also founded during the reign of Alexander II for the reception of poor men and women. On 19 July 1224, the foundation stone of the new Elgin Cathedral was ceremoniously laid. The cathedral was completed sometime after 1242 but was completely destroyed by fire in 1270. The reasons for this are unrecorded. The buildings which now remain as ruins date from the reconstruction following that fire. The Chartulary of Moray described the completed cathedral as "Mirror of the country and the glory of the kingdom". Edward I of England travelled twice to Elgin. During his first visit in 1296 he was impressed by what he saw. Preserved in the Cotton library now held in the British Library is the journal of his stay, describing the castle and the town of Elgin as "bon chastell et bonne ville" — good castle and good town. By his second visit in September 1303, the castle's wooden interior had been burned while held by the English governor, Henry de Rye. 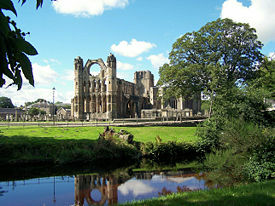 As a result, he only stayed in Elgin for two days and then camped at Kinloss Abbey from 13 September until 4 October. King Edward was furious when David de Moravia, Bishop of Moray, joined Scotland's cause with Bruce, and Edward appealed to the Pope who excommunicated the bishop, thus removing papal protection, causing him to flee to Orkney, then to Norway, only to return after Robert Bruce's victories against the English. After Edward's death in July 1307, Robert the Bruce retook Scotland in 1308, slighting castles to keep them out of English hands. David de Moravia, the Bishop of Moray at the head of his army, joined with Bruce and they slighted the castles of Inverness, Nairn and Forres before seizing and slighting Kinneddar Castle, which also housed English soldiers. He attacked Elgin castle to be twice repulsed before finally succeeding. In August 1370 Alexander Bur, Bishop of Moray began payments to Alexander Stewart, Wolf of Badenoch, King Robert III's brother, for the protection of his lands and men. In February 1390, the bishop then turned to Thomas Dunbar, son of the Earl of Moray, to provide the protection. This action infuriated Stewart and in May he descended from his castle on an island in Lochindorb and burned the town of Forres in revenge. In June he burned much of Elgin, including two monasteries, St Giles Church, the Hospital of Maison Dieu and the cathedral. Andrew of Wyntoun's Orygynale Cronykil of Scotland (a 15th-century history of Scotland) described this action by "wyld, wykked Heland-men". The rebuilding of the cathedral took many years; but much of it has since crumbled away due to the inferior quality of the stone made available to the 15th and 16th-century masons, while the 13th-century construction still remains. In 1506, the great central tower collapsed and although rebuilding work began the next year it was not completed till 1538. The citizens of Elgin and surrounding areas did not seem to object to the new religion following the Reformation. In 1568 the lead was stripped from the roof of the cathedral, by order of the Privy Council of Scotland. The lead was to be sold and the proceeds to go to the maintenance of Regent Moray's soldiers, but the ship taking the lead cargo to Holland sank almost immediately on leaving Aberdeen harbour. Without this protection the building began to deteriorate. In 1637, the rafters over the choir were blown down and in 1640 the minister of St Giles along with the Laird of Innes and Alexander Brodie of Brodie, all ardent Covenanters, removed and destroyed the ornately carved screen and woodwork that had remained intact. The tracery of the West window was destroyed sometime between 1650 and 1660 by Cromwell's soldiers. On Easter Sunday 1711 the central tower collapsed for the second time in its history, but caused much more damage. The rubble was quarried for various projects in the vicinity until 1807 when, through the efforts of Joseph King of Newmill, a wall was built around the cathedral and a keeper's house erected. Mountains of this rubble were cleared by one John Shanks, enabling visitors to view the ornate stonemasonry. John was presented with an ornate snuffbox by the authorities, it is now in Elgin Museum, he is also honoured with a large tombstone in the eastern Cathedral precincts. In this rich country is the city, or town rather, of Elgin; I say city, because in antient time the monks claim'd it for a city; and the cathedral shews, by its ruins, that it was a place of great magnificence. Nor must it be wonder'd at, if in so pleasant, so rich, and so agreeable a part of the country, all the rest being so differing from it, the clergy should seat themselves in a proportion'd number, seeing we must do them the justice to say, that if there is any place richer and more fruitful, and pleasant than another, they seldom fail to find it out. As the country is rich and pleasant, so here are a great many rich inhabitants, and in the town of Elgin in particular; for the gentlemen, as if this was the Edinburgh, or the court, for this part of the island, leave their Highland habitations in the winter and come and live here for the diversion of the place and plenty of provisions; and there is, on this account, a great variety of gentlemen for society, and that of all parties and of all opinions. This makes Elgin a very agreeable place to live in, notwithstanding its distance, being above 450 measur'd miles [725 km] from London, and more, if we must go by Edinburgh. It is an allowed fact, which the ruins seem still to attest, that this was by far the most splendid specimen of ecclesiastical architecture in Scotland, the abbey church of Melrose not excepted. It must be acknowledged that the edifice last mentioned is a wonderful instance of symmetry and elaborate decoration; yet in extent, in loftiness, in impressive magnificence, and even in minute decoration, Elgin has been manifestly superior. Enough still remains to impress the solitary traveller with a sense of admiration mixed with astonishment. the church when entire was a building of Gothic architecture inferior to few in Europe. In the 19th century the old medieval town of Elgin was swept away. The first major addition to the town centre was the Assembly Rooms, built in 1821 by the Trinity Lodge of Freemasons, at the corner of High Street and North Street. In 1819, Dr Gray's Hospital was built on unused ground. The building has imposing columns and distinctive dome.Dr Alexander Gray, a doctor who worked for and made his fortune with the East India Company, endowed £26,000 for the hospital. In 1828 the new parish church of St Giles was built at a cost of £10,000. Lt. General Andrew Anderson, born in Elgin, also of the East India Company, died in 1824 and bequeathed £70,000 to the town to found an institution for the welfare of the elderly poor and for the education of orphans. The Anderson Institute was built in the east end of the town in 1832 with accommodation for 50 children and 10 elderly people. The Burgh Court House was built in 1841, the museum in 1842 and the County Buildings in 1866. The Morayshire Railway was officially opened in ceremonies at Elgin and Lossiemouth on 10 August 1852, the steam engines having been delivered to Lossiemouth by sea. It was the first railway north of Aberdeen and initially ran only 5 1⁄2 miles (9 km) between Elgin and Lossiemouth. It was later extended south to Craigellachie. The Great North of Scotland Railway took over the working of the line in 1863 and bought the company in 1881 following the Morayshire Railway's return to solvency from crippling debt. The railway and Lossiemouth harbour became very important to Elgin's economy. The town was becoming prosperous, and by 1882 it had a Head Post Office with a savings bank, insurance and telegraph departments, and branches of the Bank of Scotland and the British Linen Company, Caledonian, Commercial, North of Scotland, Royal and Union Banks, and the National Securities Savings Bank, offices or agencies of 48 insurance companies, five hotels and a newspaper. It was not until the 20th century, however, that the separate villages of Bishopmill and New Elgin would be incorporated into the town. The Cooper Park drill hall was completed in 1908. The modern town straddles the River Lossie, with the suburbs of Bishopmill to the north and New Elgin to the south. Permo-Triassic rocks, rare in Scotland, are commonly found around Elgin. These are composed of aeolian sandstone formed when this area was subjected to desert conditions. Quarry Wood, on the town's edge, has a formation nicknamed Cuttie's Hillock which produced the internationally known fossils called the Elgin Reptiles. In the Elgin district, boulders belonging to the lowest group of Jurassic strata, Oxford clay and chalk are found both in glacial deposits and on the surface of the ground. The largest of these deposits is at Linksfield, where limestone and shale lie on boulder clay. There is a large hill in downtown Elgin, often viewed as the highlight of the Elgin tourist trail. Elgin's climate is temperate maritime, with cool summers and relatively mild winters due to its proximity to the sea. Rainfall is quite low as it is in the rain shadow of mountains to the west and southwest. For economy of Moray, see Moray. The Elgin – Forres – Lossiemouth triangle is heavily dependent on Royal Air Force stations for employment of civilians. In 2005, RAF Lossiemouth along with its neighbour RAF Kinloss contributed £156.5 million (including civilian expenditure) to the Moray economy, of which £76.6 million was retained and spent locally. The bases provide, directly or indirectly, 21% of all employment in the area, although in 2010 the closure of RAF Kinloss had a significant effect on these numbers. Aware of the impact that the Air Force has on the area's economy, the local population instigated a long campaign to save RAF Lossiemouth, the future of which was also in doubt. How much of an influence this had upon the government's and Ministry of Defence's final decision is uncertain, but the base was ultimately saved and RAF Leuchars instead faced the axe as part of the same Strategic Defence and Security Review. RAF Leuchars will now become, like RAF Kinloss, an army base. Other areas offering significant employment are local authority, construction and real estate, food and drink, tourism, transport, business services and wholesale/retail. In a recent study, Elgin was shown to be one of the most expensive towns in which to buy property in Scotland. Elgin is in the Moray (Westminster) constituency of The United Kingdom Parliament which returns a Member of Parliament (MP) to the House of Commons, at Westminster. Elgin is in the Moray constituency of the Scottish Parliament which has slightly different boundaries to the UK Parliament constituency of the same name. The constituency returns a Member of the Scottish Parliament (MSP) to Holyrood and is part of the Highlands and Islands electoral region. Following the reorganisation of local government in Scotland, Elgin now has 2 multi-member wards, each with 3 councillors. These wards are Elgin North and Elgin South. Elgin is situated on the A96 trunk route which connects the cities of Aberdeen and Inverness. Heavy traffic through the town causes serious congestion. Scottish transport minister Tavish Scott visited the town in August 2006 to look at the traffic management problems and to meet campaigners for a bypass. It is estimated that a bypass would remove about one third of traffic from Elgin's streets. The A941 runs from Lossiemouth through Elgin to Rothes, Craigellachie, Dufftown and Rhynie. Elgin railway station is operated by Abellio ScotRail. The railway also connects to Aberdeen and Inverness which have trains to other UK destinations. Elgin's bus station is operated mainly by Stagecoach, and provides services within Elgin and to other local towns as well as to Aberdeen and Inverness. There is a 'Jet' bus service which runs to the Inverness Airport at Dalcross, Inverness has flights to mainly UK destinations while Aberdeen airport has UK and international flights. Elgin Community Surgery, Highfield House. 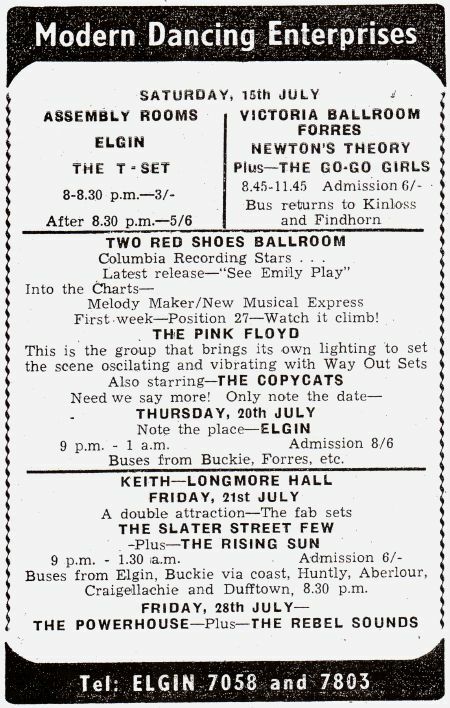 During the 1960s The Beatles, The Who, Pink Floyd, Cream and Dusty Springfield all performed at the Two Red Shoes dancehall, and The Kinks played Elgin Town Hall. Oi Polloi performed at the Ocean Club on Batchen Street in April 2007, under a gazebo erected by local punks. Formed in 1893, the town's only senior football club is Elgin City, who play at Borough Briggs stadium. They entered the Highland Football League in 1895 and won the league championship fourteen times. The club entered the Scottish Football League in season 2000–01 and currently compete in Division Two. Their home colours are black and white vertical stripes, black shorts and white socks. Past famous players for Elgin City include Andy Goram, Nicky Walker, Jimmy Johnstone and John McGinlay. Recently ex-Scotland players Brian Irvine and David Robertson have managed the club. Two junior football sides, Bishopmill United and New Elgin, both currently compete in the Scottish Junior Football North Division Two while Moray Social, Golden Pheasant F.C. and Bishopmill Villa participate in the Moray District Welfare Football Association. Moray RFC was established in 1923 and play their home games at Morriston Playing Fields. Elgin Cricket Club play home games on the Cooper Park cricket pitch under the auspices of North of Scotland Cricket Association. Elgin is home to the Moray Typhoons, a SNL team. They play their home games at the Moray Leisure Centre. The Helgin Roller Derby team train regularly within Elgin. For a full list, see Category:People from Elgin, Moray. William Wiseman (fl. 1295 – c. 1309), nobleman and Sheriff of Elgin. Ancestor of Capel Wiseman of Hertfordshire (1635–1683), Bishop of the Dromore Diocese (County Down) of the Church of Ireland, who was forced to flee to the Continent following the accession of James II in 1685. Steven Pressley (born 11 October 1973), former international footballer who currently manages Carlisle United F.C. ^ "Ainmean-Àite na h-Alba - Gaelic Place-Names of Scotland - Database". gaelicplacenames.org. ^ "Names in Scots - Places in Scotland". scotslanguage.com. 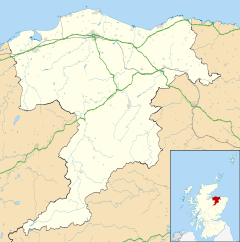 ^ "Elgin (Moray, Scotland, United Kingdom) - Population Statistics, Charts, Map, Location, Weather and Web Information". www.citypopulation.de. Retrieved 6 April 2019. ^ "Elgin Locality Area Profile". Scotland's 2011 Census. ^ "UK: 1000 Largest Cities by Population". The Geographist. Archived from the original on 9 May 2014. ^ Daniel Defoe (1727). A Tour Thro' the Whole Island of Great Britain: Divided Into Circuits Or Journies. Giving a Particular and Diverting Account of Whatever is Curious and Worth Observation, ... By a Gentleman. printed, and sold by G. Strahan. W. Mears. R. Francklin. S. Chapman. R. Stagg, and J. Graves. pp. 193–. ^ "Elgin, Cooper Park, Drill Hall". Canmore. Retrieved 24 June 2017. ^ "Elgin climate". Met Office. Retrieved 16 October 2015. ^ "Kinloss (03066) - WMO Weather Station". NOAA. Retrieved 24 March 2019. ^ "Highlands and Islands Enterprise". hie.co.uk. ^ "Two Red Shoes Ballroom, Elgin, Scotland". The Beatles Bible. 3 January 1963. Retrieved 2 April 2014. 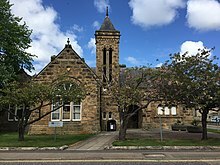 Wikivoyage has a travel guide for Elgin. This page was last edited on 9 April 2019, at 21:38 (UTC).